When I heard that Tarryn Fisher was going to reveal the synopsis for Thief, the final book in the Love Me With Lies trilogy, I freaked the freak out. Some might say my obsession with this series is unhealthy. But I would just say I’m very Passionate (with a capital “P”) . I think my fellow Passionate Little Nutcases would agree with me (I love you, girls). Thief is one of the most anticipated books of 2013 and with good reason. The series is incredibly well-written and addictive. The synopsis has been shrouded in mystery…UNTIL NOW. So without further ado….feast your eyes on Caleb and his words. Oh! And be sure to read the end of the post for some FABULOUS NEWS ABOUT THE RELEASE DATE! Deep Breaths! Deep Breaths! I can’t breathe. 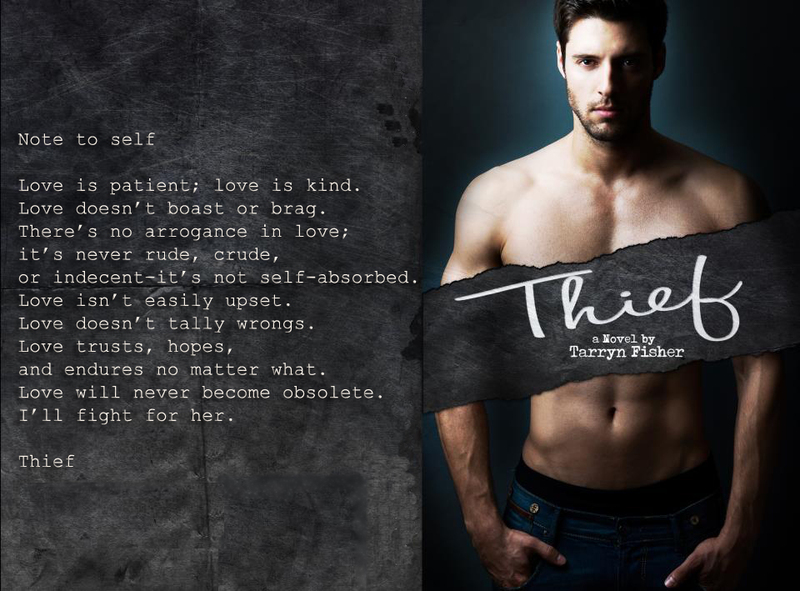 The rumor on the street is that Tarryn Fisher is going to be releasing Thief some time NEXT WEEK. If you haven’t started your reread of The Opportunist and Dirty Red NOW IS THE TIME! Hurry!! What past scene(s) are you most looking forward to in Caleb’s POV? What “present” scenes do you want to see? Are you on the #TeamHope train? I know I am!! !